A fully responsive jQuery based image gallery with lightbox, thumbnails and search. 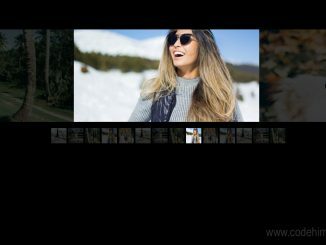 Interactive Photo Gallery a responsive CSS & jQuery based grid layout photo gallery with filter images by search. 1. To getting started using Interactive Photo Gallery, load the jQuery, Normalize CSS and Google fonts by CDN links into your website. <a href="photos/01.jpg" data-lightbox="image-grid" data-title="Hay Bales I love hay bales. Took this snap on a drive through the countryside past some straw fields. <a href="photos/02.jpg" data-lightbox="image-grid" data-title="The lake was so calm today. <a href="photos/05.jpg" data-lightbox="image-grid" data-title="The red cliffs were beautiful.